Crocheting and sewing things I love. To be completely honest, I am a summer person, I love the warmth, the sun and the long days. With that said we are upon the Fall season and I am not happy. The only aspect that I like are the yarn colors to celebrate this time of the year. I choose orange, yellows, browns and rust colors for this crochet placemat and coaster set. Everywhere in my house you can find some sort of placemat. This lends itself to even an orange background, just switching the colors around. The edgings make it a modern meets vintage crochet project. I hope that you enjoy crocheting this placemat for your home. Pattern is below. 1. Using the ribbon yarn and beginning 2 single stitches from the corner, ch 2 and sc in the first sc of the first space, ch 3, *remove hook from last ch and insert hook under the next ch-3 of the previous row; pick up the dropped chain of the ribbon yarn* . 2. Ch 3 , repeat from * to * around the entire placemat edge, ending with a ch 3 and sc in the last sc. Finish with a slip stitch. Using the first color, single crochet each stitch across to the next-to-the last stitch of the row. Row 3: (Change colors) to single crochet band for 6 rows. Row 4: Change back to main color single for 7 more rows. 1. Two hdc into corner of mat, then sc into space, * sc, hdc * , repeat around edging of mat. At end ch 2 (or 3), join in top of first hdc with a sc stitch. 3. Beginning at edge: sc 1, then * ch 6, skip 2 ribbon spaces join to mat with a sl stitch*. Repeat from * to * around edge of mat. 4. Chain Edging: *Using same color as band of placemat) Beginning at edge of mat sc in corner, * ch 6, skip 2 ribbon spaces , sl st * , repeat from * to * around edging of coaster. Flower: Join ribbon yarn near top about row 5 by sc ribbon onto mat. Ch 10, join with sl st into first sc. Continue pattern to make 5 petals. 1. Begin with Single foundation crochet stitch for 18 single stitches. Ch 1. Turn. 3. Edging is the same as for placemat. Finishing Instructions/Assembly:. Weave in all loose yarns. Blocking video placemats and coaster. 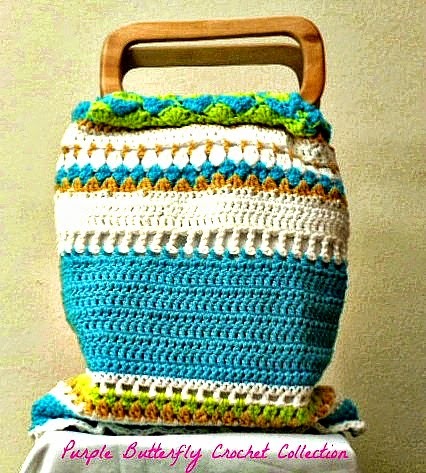 This is a first (let me remind you first written) crochet tutorial of how I add linings to my crocheted handbags. I believe it is simple enough but always welcome questions and comments. The materials pictured below are old (well let's say well used). After my son starting walking I got back into my sewing. I have a hem gauge I use because it is flat and has every measurement marking (1/4 inch and 1/2 inch) that I use for cutting out my material. I use the marking pen (which washes away) or the tailor's chalk to make my markings. The scissors I use are (I believe the best) Gingher pinking shears. (Yes they are older than my 21 yr old son. Pinking shears because it keeps the cotton (and other materials edges neat and from unraveling (unless you want to sew extra seams) and I don't. I also use a yardstick. Just in the picture above, you see my cutting board (plastic), a yard of Pellon interfacing (or your brand choice) and a yard of your choice of lining material. 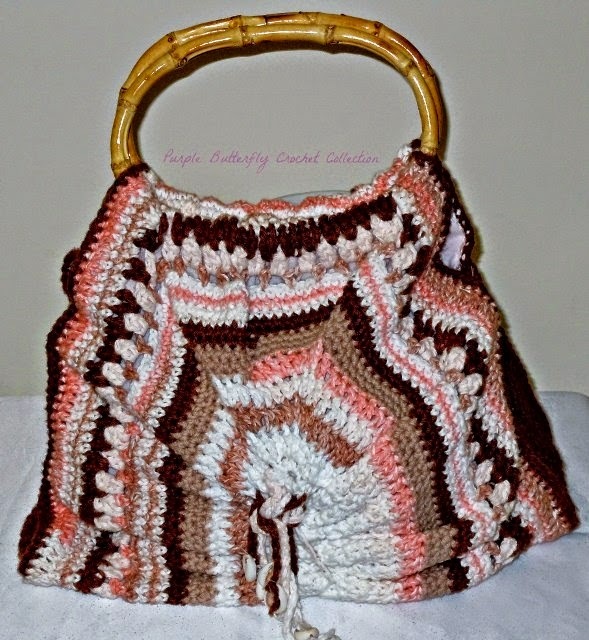 For this particular crocheted handbag I used the satin material instead of cotton. Both this material and cotton are great to use. I used my marking items (pen or chalk ) and make little markings all around the handbag. I use my yardstick to connect the dots. Then I use the pinking shears to cut out both materials. I need to say that the interfacing keeps the material from sliding around while you are cutting and sewing the material. I use interfacing for most of my linings now to give it more body so I bought the medium weight interfacing. I laid the handbag on top of the material and the material top of the interfacing. Then I made my markings of 2 sets: From the top,sides and bottom of the handbag mark 1/4" and then 1/2 inch on both sides and the bottom. The 1/4 inch will be an extra sew (safeguard if you will) while the 1/2 inch is the sew for the lining and to fit the bag. sides of course and the bottom. I tuck the material right up to 1 inch below the material. There is minimal bulk. You can even press the material down with a low setting iron for a crisper edge. I generally don't have to. I then use the blind sewing stitch to attach the lining to the handbag. This site gives a good blind stitch hand sewing tutorial. I hand stitch the bottom seam to the bottom of the bag. Right in the seam. Makes it very nice to pull something from your handbag and not have the whole lining be pulled up and out of the bag as well. 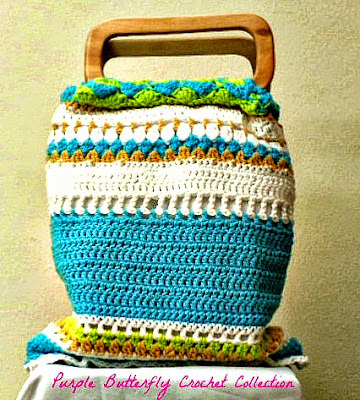 Tip for sewing the lining to my crocheted shell stitch cotton handbag. Until the next time ~ Keep the Faith and Plenty of Yarn! Surfing the internet,the Face Book,Twitter and other artisan/crafter social networks I hear the question: “Ok, Is it really necessary to block my crochet projects. What is the difference if you do or don't block your crochet? A little bit of background,When I first learned to crochet I knew nothing about blocking probably because I was concentrating on learning the various crochet stitches and because crochet was not associated with the computer it was a “Come sit by me, let me show you how to crochet. Of course from there you learned to single crochet,double crochet, how to make a circle, a square then stitch them together. I didn’t learn about blocking a crochet garment/accessory until about say six years ago. Before then I washed the item laid it out by hand and it looked pretty good. I have some pieces I still own that I crocheted in my twenties. I am now 54. When my mother shared the art of crochet with me she didn’t go into the whole process of blocking your pieces but she did know that if you had an item made of yarn you needed to smooth is out and lay it flat to dry in good shape. Two crochet pieces that have not been blocked. Let’s fast forward to today. Yes I absolutely agree with blocking my crochet projects better yet each piece as I finish them. What a difference in seeing how the crocheting project will look and most importantly fits together. Basically for me the same thing that my mother taught me when washing sweaters, pulling them into shape (well not exactly pulling) and laying it flat to dry. Never hang crochet on hangers. Blocking relaxes the yarn and gives that neat finish. This is my handmade blocking board. I explain what is made of and how I made my blocking board in my crochet video. Can you guess what it is made out of? This is a piece of wool before it was blocked and after. Wool for me (because I crochet so tightly wrinkles). Does this happen to you? Crochet side handbag pieces after they were blocked. This is a worsted wool piece for a new handbag. - the same 2 curled crocheted pieces in the photo above. The crochet is quite tight(thus the other need for blocking), but because they will be the sides I will be reinforcing these sides with a type of interfacing. Until next time Keep The Faith and Plenty of Yarn!